Dr. Cheryl Lynne Galler has made it her mission to help families prepare for the life changes that come after a sudden critical event. Having had trauma herself, Dr. Galler knows how important it is to plan according to your own needs. With 19 years of experience in contingency planning and research, it is definite that contingency planning discussions need to be done at home at the dinner table to establish a positive mindset for problem-solving. Without a solid plan, you lose the benefit of a quick response time. Never lose your option to choose what happens. Create a plan to survive any situation with your family while taking factors such as culture and beliefs into the equation. Our organization assists with contingency planning that allows for pre-thinking of what steps must be taken after a sudden loss. Circular planning allows you to control the path that your family takes to get back to the life you know. Take a personal approach to better prepare your family for any situation with our CIRCULAR PLANNING LESSONS. With online scenarios, we assist families with creating a custom plan for their specific needs in the event of a sudden loss of any kind in an emergency. We focus on the worst case possibilities so that your family is prepared to deal with it and knows what steps will be your first ones. RECOVER ON YOUR OWN TERMS. NEVER GRAB A SOLUTION THAT DOES NOT FIT WHO YOU ARE. We are professionals who have lived through disaster and trauma and know first hand what should be planned for. 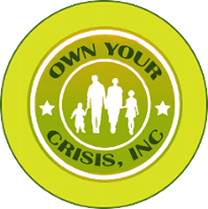 We have formed OwnYourCrisis, Inc, to make a difference for other families who have not yet planned for their safety and communication when they are in trouble. We offer essential perceptions and considerations for every family to work with in order to be ready for their personal post-disaster situation. The truth is that accidents and losses happen with and without a hurricane. Most of us have not planned for this possibility beyond an insurance policy. The end result is a specific plan that is built around the needs of your family, as well as a communication network of family and friends to respond with predetermined functions for your immediate needs. BE IN CONTROL OF YOUR CIRCUMSTANCES! LET YOUR PLAN SPEAK FOR YOU WHEN YOU CANNOT SPEAK FOR YOURSELF. GET A NETWORK TO COMMUNICATE WITH AND BE READY TO HAVE HELP WHEN THE UNTHINKABLE HAPPENS!! Our program is FREE to check out and play with. DONT WAIT!